This photo is from the front page of the Herington Times in the State of Kansas. 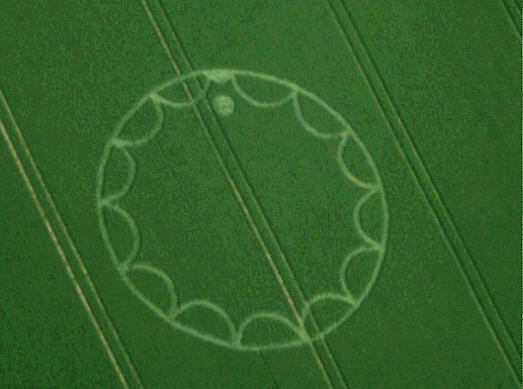 As you can see in the photo, the crop inside the edge of the circle has grown taller than the center of the crop circle. What would cause that to occur? In my opinion, this is not a man-made crop circle, though I could not venture a guess as to what energy formed it. 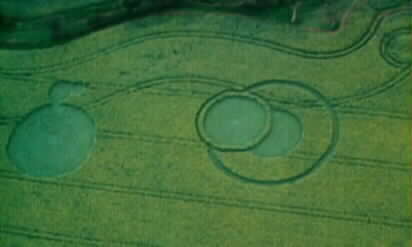 There have been many crop circles in the past showing circles and rings. It can represent the sun and the moon, or a coming eclipse, or a religious implication such as you have at weddings, with a circle of friends and the exchanging of rings. 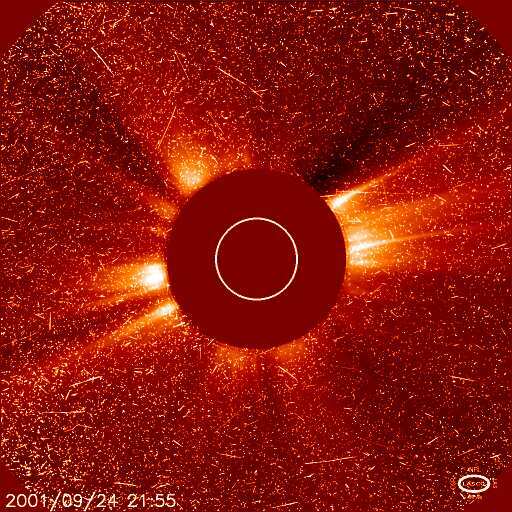 There was an eclipse crop circle in 1999.
strongly suggesting a solar eclipse. There are a number of crop circle formations that may be related to the 1999 eclipse. Here is a collection of similar crop circles which we have written about in the past. The crop glyph being in Kansas, we immediately think of the Wizard of OZ, which has many metaphorical symbols, such as the yellow brick road which is the path of life. It is made of a combination of gold and silver. Those two metals are directly associated with the sun and the moon. The road of yellow brick is an element in the novel The Wonderful Wizard of Oz by L. Frank Baum. The 1939 movie The Wizard of Oz based on the novel gave it the name by which it is better known, the yellow-brick road. In both novel and movie, it is the path which Dorothy is instructed to follow from Munchkin Country to the Emerald City in order to seek the aid of the Wizard of Oz. Scholars have analyzed the book and movie in terms of the extensive use of political images and metaphors. The Yellow Brick Road is seen as the gold road; in the 1890s gold and silver were the subjects of heated political debates. (The magical silver slippers were colored ruby-red in the movie). NOTE: Right now, there is hot debate whether to buy silver and gold (precious metals) because the U.S. dollar is being devalued as we speak. For details see Political interpretations of The Wonderful Wizard of Oz. In the book The Patchwork Girl of Oz it is revealed that there are two yellow brick roads from Munchkin Country to the Emerald City: according to the Shaggy Man, Dorothy Gale took the harder one in The Wonderful Wizard of Oz. It is often a misconception that the yellow brick road leads to "Oz". In actuality the yellow brick road was already in Oz and led to the Emerald City. The movie adds to the confusion when the Scarecrow and Dorothy say, "To Oz?" "To Oz!" As "Oz" is also a nickname for Australia, phrases like "down the yellow brick road" are sometimes used to mean "in Australia". However, considering that the Wizard of Oz is located at the Emerald City (and refers to himself as "Oz, the great and powerful" in the movie), the misconception is understandable. As a result of the interpretation of the yellow-brick road as the road "to Oz", yellow brick road has also become a stock phrase referring to a path which leads to a life of fantasy and carefreeness. Phrases referring to the "yellow brick road" are sometimes perceived as hopelessly idiomatic by non-native English speakers. There are also real Yellow Brick roads, such as the one in Hoboken, New Jersey (Castle Point Terrace). In the movie, we find out that the Wizard is not who you thought he was, but another guy like the rest of us with great wisdom setting a goal for those on the path. In the movie, we have three male travelers with Dorothy, the scarecrow, the lion, and the tin man, who each have shortcomings. The lion in Leo is a major sun symbol, (son/sun). Dorothy herself is a goddess symbol such as Artemis/Diana has the three aspects of the moon - Her twin brother is Apollo the sun god. Revelation 9:11 refers to him. Note: We received this information in an e-mail dated 9-5-2001, prior to the World Trade Center event. It seems rather prophetic. Under the World Trade Center are 7 floors which go into a deep pit. (This is another name for Satan and possibly his posterity. Biblical scholars say this is the 'destroyer'. Helena P. Blavatsky states that the 'destroyer' is the God Shiva). Apollo killed the python serpent at Delphi. "y2k file ended in gobc.htm"
The voice said "this would be helpful." "Y2K magazine in gold, yellow, and black more practical hints." "survival dog - see dream of grapes and raisins." NOTE: It was amazing how many times I heard those same words in other places in the next few weeks. An old woman at the front door said, "Oh Dolores! like she was asking for help. "Thank you! Good morning! We have come to tell you , to warn you, of things to come. There will be earthquakes, tsumanis, tornadoes! Sympathy will be widespread, but will not dull the terror of those involved in these incidents. We welcome any feedback from those who would read these words, but heed the warning ... there is more to come. Thank you. That is all!" I then had a vision of a huge red sun as though it were setting . It was immense. A voice said, "Remember! The Big Red Ravager is the Wizard of Oz!" "I did a web search on "big red ravager" and nothing. Then I did one with just "red ravager". This is from the Encyclopedia of the Celts. It may not apply, but thought I'd send it to you anyway! In apprecation of your hard work, "
greater than all three: Arthur was his name. but where Arthur went, not for seven years. Lost Springs, Kansas, is a little south of Herington and about 90 miles northeast of Wichita. anomalies allegedly have occurred as well recently. 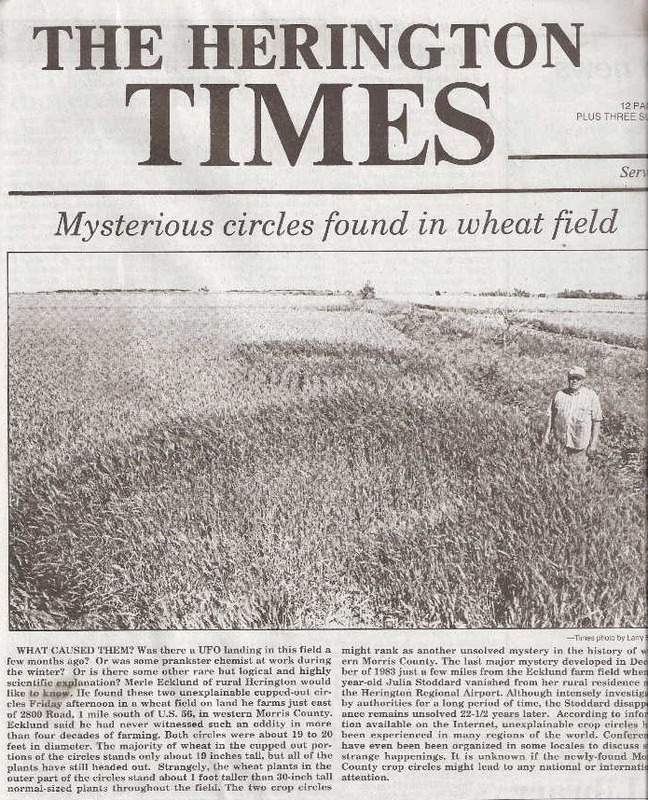 June 10, 2006 Lost Springs, Kansas - Last night I talked with Lost Springs, Kansas, farmers Merle and Diane Ecklund about the highly strange accelerated and decelerated growth of wheat in the pattern of a circle surrounded by two rings in their wheat. Mr. Ecklund discovered the baffling wheat plants on Friday, June 2, about 2:30 p.m. while he was working along the perimeter of his wheat field. Merle Ecklund, Cereal Crop Farmer, Married to Diane Ecklund, 40 Years Farming in Lost Springs, Kansas: “I was spraying trees along the tree line, the perimeter of the wheat field. All of a sudden I discovered wheat that was taller than the rest of it. And I thought to myself, ‘Why is this wheat taller than the rest of it?” I got off the 4-wheeler and looked. And I said, ‘Oh, my God. Here is a circle and rings in my wheat!’ In all my years of farming, I've never seen anything like it! There haven't been any birds or insects in this place where the wheat has grown shorter in the center and longer on the outside. I took my water witching rods (dowsing rods) and they do cross as soon as you get to that area. I also took my dog out there. My dog will not enter the area. Animals know there is something wrong there. 20 feet in diameter. The inner circle is about 15 feet in diameter and grows 19 inches high. SURROUNDED BY YOUR NORMAL HEIGHT WHEAT, WHICH IS 39 INCHES TALL. SURROUNDED BY ANOTHER RING THAT IS 42 INCHES HIGH. BIOPHYSICIST W. C. LEVENGOOD IN MICHIGAN HAS DONE LOTS OF WORK STUDYING ACCELERATED AND DECELERATED GROWTH IN CROP FORMATIONS. YOU’VE GOT EXAMPLES OF BOTH IN YOUR FIELD. IN YOUR CASE, SOMETHING HAS SLOWED THE WHEAT GROWTH DOWN IN THE CENTER (19 INCHES TALL), THEN LEFT SOME WHEAT ALONE (39 INCHES TALL), AND THEN THE OUTER RING HAS ACCELERATED GROWTH 42 INCHES TALL). Right, and some people from Kansas State University came out Thursday morning (June 8) to get some wheat samples to see if they can come up with an answer." While checking his field prior to intended harvest, farmer Merle Ecklund discovered 2 circles near the edge of his wheat-field, which were not seen in March when the field was sprayed with an herbicide. Since Mr. Ecklund had not visited the field since March, the date of arrival of the circles is unknown. However, the plants inside these circles are markedly different from the norm, in that (a) the plants are all standing, (b) the plants in the centres of the circles are very short--but apparently have fully developed seed-heads, and (c) there is a 4-inch-wide perimeter swath of plants in which the plants are "at least 1 ft. taller" than the crop in the rest of the field. Mr. Ecklund states that the centre plants are only about 4 inches tall, with seed-heads, and that the seeds within these seed-heads are "shrunken" and "brown." Further he reports that the plants get taller as they approach the edges of the circles, up to the perimeter swath. These perimeter plants were still green when the circles were first found and the seed-heads in these plants are nearly "twice the size" of the normal, controls outside the circles. This means that the seed-heads in this 4-inch-wide perimeter swath are about 6 inches long, and contain much larger seeds. The farmer states that UFO activity was reported nearby in February and wondered if whatever occurred in his field happened back then, when the seed was still in the ground (before any shoot development). He states that his dog would "not go into the centres of the circles" (returning instead to the car) and that he could see no insects in these centres. He also reports watching birds separate and fly "around" the sides of the circles, rather than fly directly over them. Mr. Ecklund is a dowser and reports that he and 2 other people all tried the dowsing rods and observed them to "cross right away" in the centres; it was his feeling that there was a "lot of energy in the centres" of the circles. The owner of the land (Mr. Ecklund rents this property) called in some specialists from Kansas State University and some soil samples were taken, and Ecklund believes higher nitrogen values were reported to have been found in the soil from the perimeter ring area. For many years W.C. Levengood has stated that he has found evidence of "clear delineation" of the various energies involved in creating crop circles. These Kansas circles--because they were not discovered until the field had had time to mature-- may be demonstrating exactly this point. Two of the energies hypothesized by Levengood as being involved in crop circle causation are microwave radiation (which is thought to be responsible for retardation of growth frequently documented when circles occur in immature crop) and unusual electrical pulses (which are known to promote growth, as well as yield). If WCL is correct, the markedly smaller centre plants must be revealing the effects of exposure to concentrated microwaves--while the taller perimeter plants show the result of exposure to the unusual electrical pulses (called "ion avalanches" by WCL)--both effects now evident because the circles were not discovered and the plants were allowed to grow to maturity following the initial exposure. The BLT Research Team will obtain both plant and soil samples and will follow up the Kansas State University test results as soon as possible. Photo(s) will be provided as soon as they are available.